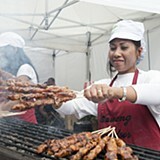 The photo gallery illustrates the exciting events which have taken place across the Borough since 2012. Can you spot yourself in the pictures? A Field in Woking The Woking Library Poppy Project was inspired by the Tower of London poppy display in 2014. As part of a series of events commemorating 100 years since the end of World War 1, Woking Library called on local residents to make enough hand-made poppies to represent every person whose name was engraved on a war memorial in Woking Borough. 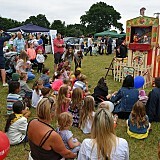 Byfleet Events 2017 Byfleet Village had a variety of events during 2017, something for everyone to get involved in. With nearly 2,500 people attending Parish Day and 400 Remembrance Service. 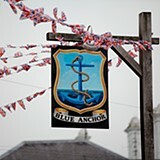 The community also organised a Running Festival, Christmas light Switch on and Christmas market. Diwali Parade 2017 Crowds gathered in Woking Town Centre on Thursday 12 October to celebrate Diwali with a lantern parade marking this festival of light, followed by a celebration event at the HG Wells Centre. Party in the Park 2017 This year the party is 'Rockin' All Over the Park' as Woking celebrates its musical legacy, paying tribute to Rick Parfitt from Status Quo and The Jam with a swingin' sixties and psychedelic 70s theme. Workshops were courtesy of Neville Godwin of www.ngdagency.com. Unveiling of Kenwood Blue Plaque On 7 September a Blue Plaque was unveiled by Mayor Graham Cundy to commemorate the opening of the first Kenwood workshop in Woking 70 years ago. 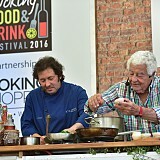 Woking Food & Drink Festival 2017 Woking was packed for the three day festival with thousands of people sampling produce from near and far and a huge selection of top culinary experts. Diwali Parade 2016 Celebrating new beginnings, the victory of good over evil and the triumph of light over dark, an estimated 600 people gathered in Woking Town Centre on Thursday 3 November to take part in the town's annual Diwali Parade. H.G. 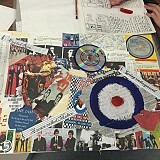 Wells Inspired Artwork The Wells in Woking celebrations inspired local artists and school children to produce some lasting Wells images. H.G. 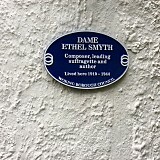 Wells launch event To mark the 150th birthday of H.G. Wells, the man who put Woking on the map by destroying it, The Lightbox Gallery hosted the launch of the programme followed by an exhibition of works inspired by Wells' Sci-Fi masterpiece War of the Worlds. 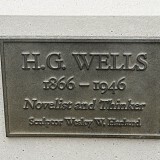 H.G.Wells Statue - Novelist and Thinker The H.G. Wells statue was designed by Wesley W. Harland. A closer look at the statue will reveal reference to a few novels of the famous author. Enjoy looking back at Wesley's journey from the initial idea, maquette, making, moulding, bronzing and installation stages to the unveiling of the statue. 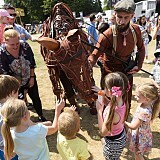 Party in the Park 2016 Star Wars fans and science fiction enthusiasts gravitated towards Woking Park in their thousands on Saturday (9 July) for Woking’s biggest and best outdoor party! Woking Borough Council set out to host a galactic-sized birthday bash in honour of H.G. Wells, and it succeeded in its mission with 2016's science fiction themed Party in the Park pulling in an estimated 20,000 visitors! 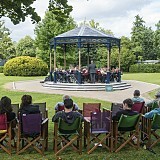 Summer Sounds Every summer from May to September you can watch a series of concerts in Woking Park by local Surrey based bands including jazz, steel and brass bands, choral groups and orchestras. Surrey Half Marathon 2016 Woking and Guildford roads were filled with almost 5000 runners, and lined with hundreds of spectators who celebrated the 3rd Surrey Half Marathon on Sunday, 13th March. 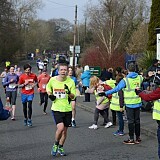 From first-time fundraising runners to elite athletes aiming for a PB on the fast and flat course, Woking Leisure Centre was brimming with excitement as the 2XU Surrey Half which was started at 9am by the Mayor of Woking, Cllr Derek McCrum. Unveiling of the H.G. Wells Statue Novelist and Thinker has been designed by local sculptor Wesley W. Harland. The statue represents a young Wells in his late 20s in a thoughtful, seated pose. It reflects the author as both a famous novelist and important political thinker, quietly considering the world around him. 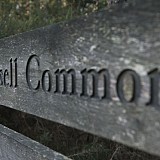 Wells in Woking This gallery is a selection of photos across Woking tracing the path of Wells. Muslim Burial Ground Peace Garden opening In an act of remembrance, His Royal Highness The Earl of Wessex KG GCVO, officially opened a new Peace Garden at the site of a beautifully restored Muslim Burial Ground in Woking. Party in the Park 2015 T-birds and Pink Ladies gathered on Saturday (11 July) to enjoy a day of vintage themed entertainment, sunshine, live music and an open-air screening of hit movie, Grease. 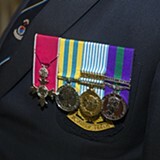 VC Commemoration Service for Major Richard Willis Major Richard R Willis VC was one of six soldiers to receive a VC, the highest military decoration awarded for valour in the face of the enemy, during the first morning of the Allied Force’s Gallipoli campaign. 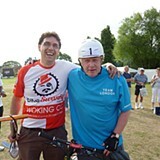 Woking Bikeathon 2015 The much loved Woking Rotary Bikeathon took place on Sunday 10th May. It was enjoyed by young and old around scenic routes. 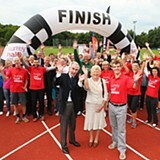 The Woking Rotary Bikeathon is organised by The Woking Rotary Club. It is not a race but a sponsored fun ride for the benefit of local charities. 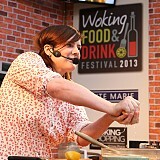 Woking Food & Drink Festival 2015 The third annual Woking Food and Drink Festival 2015 was another mouth-watering ‘feastival’ and attracted record numbers of visitors, exhibitors and chefs. Party in the Park 2014 Around 5,000 visitors braved the changeable weather conditions to enjoy an extravaganza of music, dance, sport and culture. Sport Relief 2014 Sport Relief 2014 saw Woking residents pull out all the stops to raise funds for charitable causes. Thanks to everyone who took part! Surrey Half Marathon The first Surrey Half Marathon between Woking and Guildford was a huge success with nearly 5,000 runners pounding the leafy roads of Surrey. The Bandstand in Woking Park Relax with a picnic in Woking Park and soak up some music during the summer. 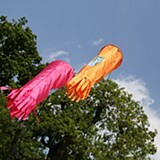 Throughout the summer crowds will be entertained by a range of jazz ensembles to steel and brass bands. All performances begin at 2pm during June and September. Tour Series 2014 Around 5,000 visitors braved the changeable weather conditions to enjoy an extravaganza of music, dance, sport and culture. Woking Food & Drink Festival 2014 It was 'sunny side' up for in excess of 60,000 visitors at the second Woking Food and Drink Festival from Friday 5 to Sunday 7 September 2014. 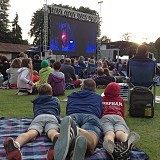 Celebrate Pyrford 2013 Boris, bikes and a big screen! Celebrate Pyrford welcomed cyclists from all over the world and taking part in the Prudential RideLondon event. Party in the Park 2013 Over 8,500 visitors basked in the glorious sunshine at the second Party in the Park, which took over Woking Park on Saturday 13 July 2013. Tour of Britain 2013 The creme de la creme of professional cyclists, including Mark Cavendish, whizzed through the Borough for the second year running. 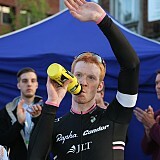 Tour Series 2013 Olympic Gold Medallist, Ed Clancy, snatched victory in the final stages of the race. The win made Clancy the most successful rider in Tour Series history. Woking Bikeathon 2013 Back by popular demand, hundreds of cyclists donned their cycling hats and yellow t-shirts to wheel around the local countryside for a good cause. Woking Food & Drink Festival 2013 Over 20,000 foodies were treated to a tantalising array of culinary delights when the first Woking Food and Drink Festival took place in Woking Town Centre. Byfleet Celebrations 2012 Local children donned colourful sports gear and fancy dress, and marched along the local High Road to welcome the start of the London 2012 Games.